직지사 대웅전 앞에 동·서로 서 있는 2기의 석탑으로, 원래 경북 문경의 도천사터에 쓰러져 있던 것을 이 곳으로 옮겨 놓은 것이다. 두 탑 모두 각 부분의 양식이 같아서 1단의 기단(基壇)위로 3층의 탑신(塔身)을 올리고 있다. 여러 장의 넓적한 돌로 짜여진 기단은 4면의 모서리와 가운데에 기둥 모양의 조각을 두었다. 탑신의 각 층 몸돌과 지붕돌은 각각 하나의 돌로 이루어져 있으며, 각 몸돌에는 모서리마다 뚜렷한 기둥 모양의 조각이 새겨져 있다. 얇고 평평한 지붕돌의 밑면 받침으로 1·2층은 5단, 3층은 4단을 두었고, 수평을 이루던 처마는 네 귀퉁이에서 경쾌하게 들려 있다. 꼭대기에 올려진 거대한 모습의 머리장식은 1976년 탑을 옮겨 세울 때 새로 만들어 장식해 놓은 것이다. 탑신의 1층 몸돌 높이가 지나치게 높긴 하나, 전체적으로 세련된 분위기를 자아내고 있다. 기단이 1단이고, 지붕돌의 들린 정도 등으로 보아 통일신라시대의 작품으로 짐작된다. 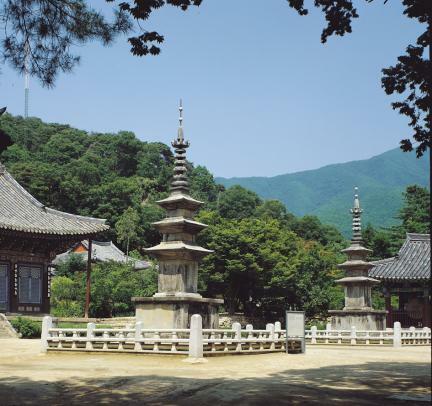 These two stone pagodas were found lying at the former site of Docheonsa Temple in Mungyeong, Gyeongsangbuk-do. 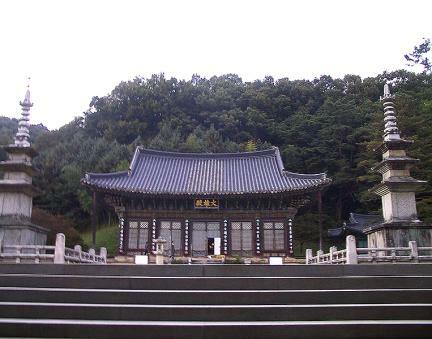 They currently stand outside the Daeungjeon Hall of Jikjisa Temple, facing each other from east to west. They are identical in appearance, both of them mounted on a single-tier base and consisting of three stories. 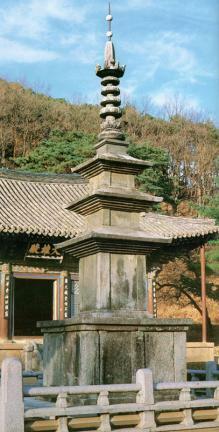 The base is made with several wide stone slabs stacked on top of one another. Pillar-shaped sculpted details are added to each of the four corner edges and in the middle of the four lateral planes. The body and roof at each level are separate stones. The body stones have a deeply-cut pillar-shaped design at each corner edge. The roofs are thin and shallow-pitched, and the roof base has a five-tier moulding at the first two levels and a four-tier moulding at the third level. The eaves are turned up lightly at the four corners. 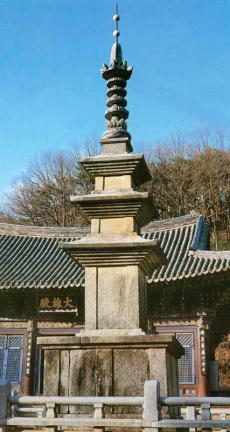 The large finials surmounting the two pagodas were added in 1976, when they were brought to their current location. 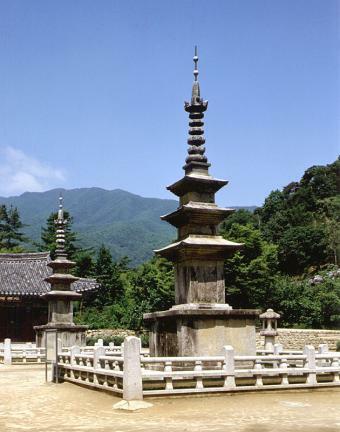 In spite of the body stone at the first story, taller than the two others, the pagodas have an overall refined appearance. 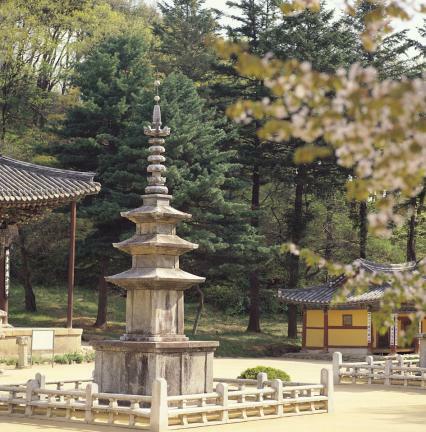 The single-tier base and the angle of the roof stone suggest that these pagodas may have been made during the Unified Silla Period.